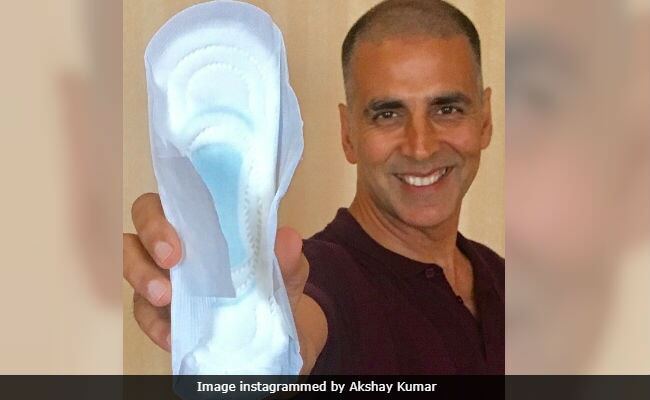 Akshay Kumar, star of this Friday's PadMan, told news agency IANS that he was told on social media that 'holding a sanitary pad is sin.' But the 50-year-old actor is hopeful that his upcoming film will de-stigmatise menstruation. "When I see social media, I see two-three people saying 'Akshay, bhai kya kar rahe ho aap? or 'You are holding a sanitary pad. It is a sin'. Imagine some people think holding a sanitary pad is a sin. But at least now they are discussing, and there will be a day when it will change and it is high time it should change," Akshay said. In the trailer of his soon-to-release film PadMan, Akshay Kumar can be seen wearing a sanitary pad and talking about menstrual hygiene. Ahead of the film's release, team PadMan challenged their colleagues to pose with a sanitary pad to tell people that 'holding a sanitary pad is not a sin.' The 'PadMan Challenge' gained momentum with the support of celebrities like Aamir Khan, Deepika Padukone, Anushka Sharma, Alia Bhatt and Anil Kapoor among others. Talking about the concept of PadMan, Akshay told IANS that earlier he did not have enough money to produce films based on socially relevant topics. His previous film Toilet: Ek Prem Katha was a critique on open defecation and the need to improve personal hygiene. The film also made it to Microsoft co-founder Bill Gates' best of 2017 list. "I always wanted to work and make such films but I was not a producer during that time. I didn't have enough money, but now I can. My wife told me about Arunachalam Muruganantham and then we met R Balki. So we thought about making this movie. Even Hollywood does not have a single film on sanitary pads or menstrual hygiene. People always make documentaries but they don't want to make commercial films because they want to shy away from the issue. We have tried to do that," said Akshay. PadMan is directed by R Balki and produced by Twinkle Khanna. The film, which is releasing on February 9, also stars Sonam Kapoor and Radhika Apte.